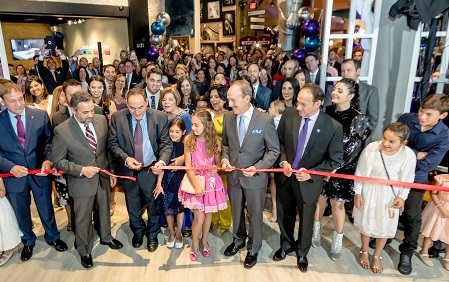 El Dorado Furniture's Capó family celebrates the opening of the new Naples, Fla., showroom. NAPLES, Fla. — El Dorado Furniture grand opened its long-awaited showroom here this past weekend, featuring the latest update to its Boulevard streetscape format. The Miami Gardens, Fla.-based Top 100 company first announced plans for its second full-service Gulf Coast location in October 2016 after purchasing the former Sports Authority location at the corner of Pine Ridge and Airport-Pulling roads in an upper-end area of north Naples. The 43,000-square-foot showroom, the retailer’s 16 th in the state, features a Boulevard setting with specialty showrooms feeding off the main street, including Home Gallery, The Terrace, Leather Living, Mattress Shop and the contemporary LIV shop. The store employs more than 45 people. When the Naples showroom opened July 28, at 10 a.m., shoppers were welcomed with live entertainment and hors d'oeuvres. The first 150 families in line receive $150 furniture gift cards. El Dorado extended the festivities the following day, by offering a leather ottoman to the first 150 families visiting. 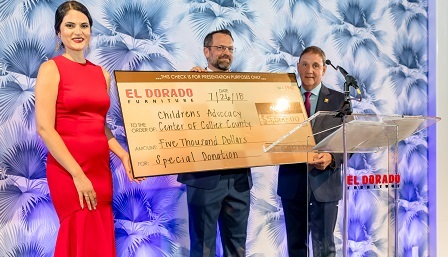 Melissa Alonso, left, Bryan Lee and Pedro Capó, El Dorado Furniture, Miami Gardens, Fla., present a special donation to the non-profit Children’s Advocacy Center of Collier County, during a celebration at the new Naples., Fla., showroom. On July 26, the retailer hosted a private event at the store, presenting a donation to the Children's Advocacy Center of Collier County during the ribbon cutting ceremony. El Dorado Furniture is No. 40 on Furniture Today’s Top 100 with estimated 2017 furniture, bedding and accessory sales of $228.8 million at then 15 stores.